West Brom have signed Ivory Coast centre-half Abdoulaye Meite from Bolton for £2m. The 27-year-old, who can also play at full-back, has agreed a three-year contract and the fee could rise to £2.5m depending on performances. He becomes Albion manager Tony Mowbray's eighth signing of the summer. 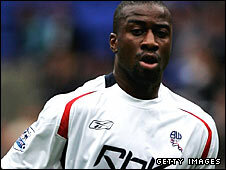 Meite, who was also targeted by Hull, joined Bolton in July 2006 after five years with Marseille and made 56 appearances for the Trotters.